So, a tent is just a tent, right? Well not exactly. There are several different types of tents. 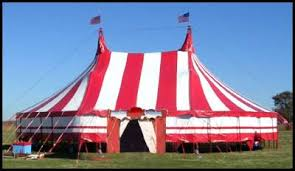 There are recreational tents, circus tents, pop up tents like you see at all the soccer games and there are party rental tents. Within the party rental tent family there are several different varieties. There are gigantic Lohsberger type tents that require special equipment and large crews to erect. They are generally used for very large events and have the benefit of not having poles internal to the structure. 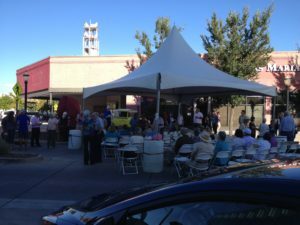 Grand events use high sierra type party tents. We have 4 different sizes, 5 if you count our hexagon. We stock and rent 10’x10’, 15’x15’, 20’x20’, 20’x40’ tents and a 35’x40’ hexagon. We have a lot of people who have never rented a party tent before and think these are just like the small 10’ x 10’ pop up tents that people buy at Walmart for $60.00 bucks. About the only thing they have in common with that pop-up tent is the word tent. 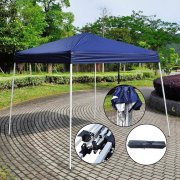 Party tents have a robust metal frame that is approximately 3” in diameter and must be constructed on the ground first. The Canvas is then stretched over the frame and secured. Next the legs are inserted and one side at a time is lifted into the air. Once the tent is erected, it is secured to the ground in 2 ways. Steel foot stakes are put through holes on the feet of each leg and driven into the ground to a depth of about 1.5’. Next, heavy duty steel outrigger stakes are driven into the ground at a 45-degree angle to the ground and corner straps which are secured to the tent are secured to the outrigger stakes. Staking is the preferred way to insure a tent is going to remain upright and stable. In the event the tent cannot be staked such as in a parking lot or on s street, plastic 55-gallon water barrels are used to secure the tent straps. Can I just set up a tent anywhere? Things to consider when considering a site or venue for a tent. Where is it? Is it accessible by delivery truck? The tents and hardware can be quite heavy and don’t lend themselves very well to being carried long distances. The site needs to be relatively flat meaning not the side of hill or over a ditch. Is the soil suitable for staking? Parts of the Grand Valley and surrounding environs can be quite sandy. If it won’t hold a tent stake, it’s probably not a good site. Are there buildings that will create a problem? Or is there enough open space near the building to erect a tent? Are there overhead electrical wires? If water barrels are needed, is there a water source nearby? No Virginia party tents do not come with sidewalls attached. Sidewalls are an option and usually include an extra labor charge to be installed. Speaking of sidewalls, what type would you like? Solid? Clear? Sidewall with a window? Sidewall with a window and door? On a 20’ x 20’ tent there are 4 sidewalls needed to be fully enclosed? Do I want all 4 or only 2 to be on the sunny side? On a 20’x40’ there are 6 sidewalls needed. The tent is erected and enclosed, do you want lighting? We have chandeliers and 2 different types of string lights. One of the most common and popular are all white string lights. We even have Par lights which have 7 different colors available to shine on the underside of the tent canopy. Whatever your party needs might be, we can make it happen at Grand Events and Party Rentals. If you Know you need a tent or aren’t quite sure, give us a call and we’ll be happy to walk you through the process. Let us make your next event Grand.